Ebony Carr raced away from the South of England Indoor Championships with gold around her neck after winning the U17s 60m. Another PB came in the 200m where she won the silver medal with a time of 25.29 behind the winner, Isio Orugun(Dartford) who recorded 25.18. Ebony’s time places her 3rd in the MK all-time rankings. The competition in the sprints is very tough with as many as 8 heats in some of the events. Jordan Heron and Rachel Oderinde made it through to the 60m semi-finals. Jordan clocked 8.23 for 4th and Rachel 8.17 for 3rd but not quite quick enough to make the final. Jordan made it through to the 200m semi-final and ran 27.11 for 4th place again. In this age group Annie Jankowiak placed 5th in her semi-final with a time of 44.55 but, again, not quite quick enough to progress further. Finally Thalia Felton placed 3rd in her heat of the 60m hurdles(9.82) There were two athletes in the under 15 girls events – Tamzin Hill 5th in her heat of the 800m(3.02.33) and Amber Evans 13th in the shot(6.98m). Niklas Adio competed in the under 17 men’s sprints. He won his heat of the 60m with a PB of 7.59 but 4th in his semi(7.69) saw him eliminated. He then ran 26.61 in the 200m heats and 9.90 in the 60m hurdles heats. 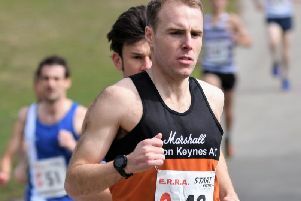 Back at home, MMKAC hosted the Chiltern Cross-Country League match around a hilly course in Campbell Park. But despite home advantage, fielding 117 athletes, could not quite stop Bedford’s stranglehold at the top of the League. On the day Bedford won with 3298pts with MK a comfortable second scoring 2906. Lara Bromilow swept to her first victory this season after a 4th and 2nd in the two previous races. With Elle Roche 6th, Nadine Lewycky, making her league debut, in 9th and Tanya Taylor 11th, MK just headed Bedford in the ladies team race. For the senior men, Steve Tuttle, 2nd and 3rd, in his last two outings had to settle for 3rd again but is well on his way to a podium place after the final race next month. The scoring ten was completed by Chris Hearn(12th),Jonathan Peters(23rd), Graham Jones(28th), Ryan Burling(40th), Jeremy Vick(45th), Josh Lyman(46th), Ross Threfall(55th), Oli Lum(61st) and Steve Herring(62nd). Best age group performances came from Kelvin Smith(5th) and John Hamilton(6th) in the M60s. In the under 17 Men’s race, Archie Rippin turned the tables on Owen Seamark for the first time this season, placing 5th with Owen 8th. Charles Wheeler(10th) and Conrad Webber(16th) completed the scoring team that placed 3rd on the day. The under 15 boys fielded 12 from a total of 51 finishers and scored a good team win. Alfie Yabsley battled it out at the front for most of the race but Freddie Ayre(Bedford) finished the stronger. Their team win saw Ewan Forsyth(6th), Connor Marley(7th) and Jake Cox(12th) backing up Alfie’s 2nd place. The under 13 boys team took 3rd place with the quartet of Robert Hickman(6th), James Dowsett(10th), Jack Sharp(22nd) and Peter Hickman(32nd). Best placed of the younger ladies teams were the under 15’s who were third on the day. Rhona Grant 9(9th) piped Emma Mears(10th) on this occasion, Jessica Nuttall finished 12th and Holly Jamieson 14th. Charlotte Moyse was just out of the scoring four, placing 15th. The under 13’s were led home by Katie Mallaghan(14th) followed by Barbara De Koning(17th), Imogen King(21st) and Gemma Milne(32nd) and placed 5th team. Finally the under 17/20 ladies saw Sophie Botham(21st) lead home Jade Brown(25th), Natalie Nurse(30th) and Elizabeth Shirley(33rd).